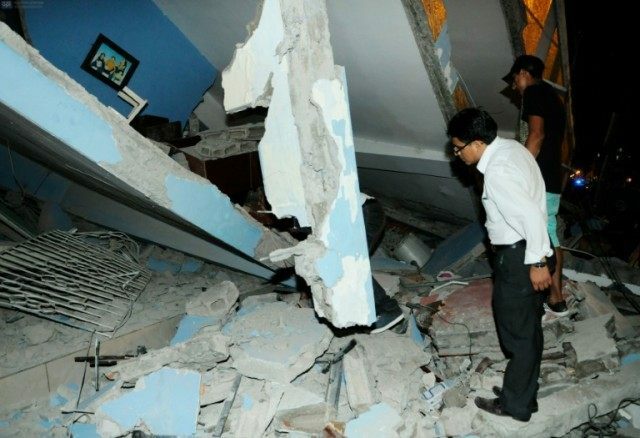 Portoviejo (Ecuador) (AFP) – Rescuers in Ecuador raced to dig out people trapped under the rubble of homes and hotels on Sunday, after a powerful 7.8-magnitude earthquake that killed at least 235. The quake reduced buildings to rubble, toppled power lines and sent terrified residents running from their homes when it struck the Pacific coast Saturday in a zone popular with tourists. Vice President Jorge Glas called it the “worst seismic movement we have faced in decades.” In a news conference on Sunday he raised the toll to 235 killed and 1,557 injured. It was centered around 170 kilometers northwest of the capital Quito, the US Geological Survey (USGS) said. Among the worst-hit towns was the Pedernales, whose mayor Gabriel Alcivar estimated there were up to 400 more dead yet to be confirmed, many under the rubble of some 40 hotels that collapsed. “Pedernales is devastated. Buildings have fallen down, especially hotels where there are lots of tourists staying. There are lots of dead bodies,” he told local media. Two Canadians were among those killed by the quake, their country’s government told AFP by email. “There was a person trapped who screamed for help, but then the screaming stopped. Oh, it was terrible,” she said. Ecuador’s Geophysical Office reported “considerable” structural damage as far away as Guayaquil, Ecuador’s biggest city with more than two million people. The US Geological Survey (USGS) said the 7.8-magnitude quake struck near the northwest shore of Ecuador. Ecuador lies near a shifting boundary between plates of the earth’s crust. It has suffered seven earthquakes of magnitude 7.0 or higher in the region of Saturday’s quake since 1900, the USGS said. One in March 1987 killed about 1,000 people, it said. David Rothery, a professor of geosciences at Britain’s Open University, said the quake’s 7.8 magnitude meant that “the total energy involved was probably about 20 times greater” than in the magnitude 7.0 earthquake that killed at least 41 people in southern Japan on Saturday. He said there was no causal relationship between the two quakes. In northern Quito, people ran out of their homes in terror as power lines swayed back and forth, knocking out power to some areas. President Rafael Correa, who was on a visit to the Vatican when the quake struck, called for “calm and unity” in a phone interview with Radio Publica. “In the coming days, we can expect acute health needs around trauma care and psychosocial support,” said Walter Cotte, the Americas Regional Director for the International Federation of Red Cross and Red Crescent Societies, in a statement. Correa said on Twitter he would visit the stricken port city on Manta on Sunday evening.